The American Lighthouse Council (ALC) is a non-profit corporation composed of a consortium of lighthouse organizations, stewards and other practitioners dedicated to the preservation, restoration, and interpretation of American lighthouses. The organization was established as the American Lighthouse Coordinating Committee (ALCC) in 1998 as an outgrowth of the National Lighthouse Museum Steering Committee, a group consisting of lighthouse preservationists, educators and administrators of lighthouse sites from throughout the United States. 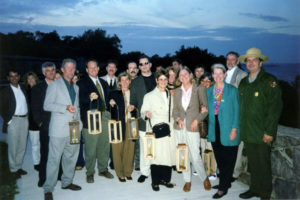 The National Lighthouse Museum Steering Committee visits Staten Island in 1998. The core of lighthouse community leaders who worked on the lighthouse museum steering committee saw the benefit in creating an organization that is part issues forum and part national leadership council. In fact, the American Lighthouse Council isn’t a traditional lighthouse heritage or preservation organization, it’s a consensus-driven group presenting the concerns on lighthouse policy issues with a unified voice. In 2016 the American Lighthouse Council became an affiliate of the U.S. Lighthouse Society. To develop a consensus-based and constituent-based position on issues of very broad and far reaching significance to the lighthouse community. To share our collective and individual research, knowledge, and education on critical lighthouse preservation and education issues with the United States Coast Guard, in addition to other federal, state, and local government officials, and other lighthouse organizations. To serve as a central communication/coordination point, keeping ALC’s constituent member organizations informed of, and educated about, critical issues. To recognize outstanding leadership in the preservation of lighthouses and interpretation of their history through presentation of the F. Ross Holland Award. The Holland Award stands as the top national lighthouse honor for individuals and organizations in the United States. 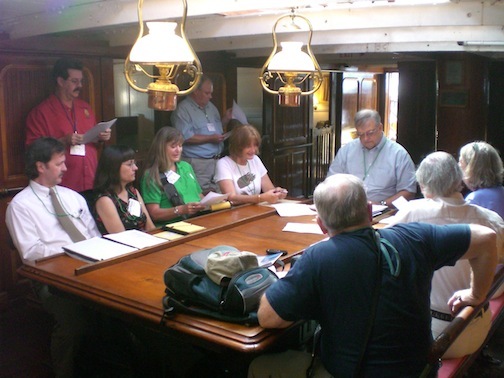 The executive committee meeting on board the STAR OF INDIA at the San Diego Maritime Heritage Conference in 2007. The ALC is not intended to replace the functions of its individual constituent organizations, but to serve as an additional and overarching voice of solidarity for the lighthouse community.